Carbohydrates and gluten often go hand in hand. Wheat-based flours are one of the most common ingredients used to make breads, cereals and other carb-rich foods, and gluten is a natural component of wheat. You'll also get gluten from foods made using rye and barley. Carbs and gluten are very different substances, however. Carbohydrates consist of sugar, while gluten is a group of proteins. Gluten refers to several different types of protein found in wheat, barley and rye. When you mix water, yeast and gluten-containing flour, then knead them together, the gluten proteins form an elasticlike web that traps the gases produced by yeast. As gases caught in the gluten matrix expand, they make the dough rise. When the dough is baked, gluten proteins help the bread maintain its shape and texture. Wheat gluten is easily separated from starches in the grain, which produces a product called vital wheat gluten. Oklahoma State University reports that vital wheat gluten is sometimes added to flour to boost its protein content. There are three types of gluten-related conditions: wheat allergy, celiac disease and nonceliac gluten sensitivity. Wheat allergies occur when antibodies in your body react to wheat proteins, causing hives, facial swelling and difficulty breathing. Celiac disease is an inherited disorder in which the immune system attacks the small intestine every time gluten enters the digestive tract. Without treatment, the intestine becomes permanently damaged, which interferes with your ability to absorb nutrients. A gluten sensitivity isn't an allergy or an autoimmune disease. If you're sensitive, consuming gluten causes gastrointestinal symptoms but it does not cause damage to the small intestine. Carbohydrates consist of molecules of sugar. Simple carbohydrates are made from just a few molecules. Other carbs contain many molecules of sugar connected into long, complex chains. These larger molecules are known as the complex carbs or starches. Sugars and starches fill one primary job: They're used by all of the cells in your body to produce energy. The only difference is that simple carbs gain quick access to your bloodstream, while complex carbs take longer to digest and enter your system more slowly. Sugars and starches have 4 calories in every gram you consume. Fiber is also a carbohydrate essential for your health, but it's not digested like sugars and starches. 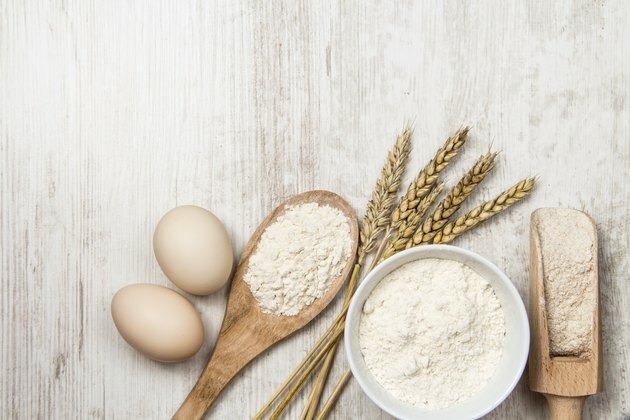 Whether the carbohydrate-containing foods you eat are made from whole grains or processed flour, they will contain gluten if the flour comes from wheat, rye or barley. Gluten-free foods still contain carbohydrates, but their carbs come from flours made from grains and beans that are naturally free of gluten. Some of the replacements include flours made from rice, beans, sorghum, potatoes and millet. Many of the gluten-free flours contain about the same total carbs as gluten-containing flours, but there are a few exceptions. Bean flours tend to have fewer total carbs, while flour made from rice or potatoes contains more total carbs than all the other types of flours. University of Florida IFAS Extension: Being Smart About Gluten and Gluten-Free Issues, Part 1: What Are the Health Concerns Surrounding Gluten?